LAGOS: The two men in the motorized wooden canoe look around warily as they leave a towering shipwreck in the Lagos lagoon, with the barrels of oil on board barely concealed under rags. The rusting hulk of iron and peeling paint has been battered by the elements and is half submerged in the water. Sprouts of green shoots on deck indicate how long it has been abandoned. But on closer inspection, the wreck is a working storage facility for stolen or “bunkered” oil, as it is known in Nigeria. “Oladele”, a 30-year-old who did not want to publicize his real name, has plied the waters on his boat since he was 15. He says it’s not the only wreck that stores illegally imported oil brought into the port by the huge tankers delivering petrol and gas, then sold on in neighboring Benin and Togo. “Every ship does it. They will declare 10 tons but bring in 12,” he said. “We will store them in the tanks, deep inside the wrecks, then at night usually, it will be picked up.” Middle men could typically make at least $80 to $200 (70 to 180 euros) a trip for several years. “It’s big business,” he said. From there, the waters offer an easy route up the Lagos coast to Benin and beyond. Expensive scrap metal culled from unmanned wrecks can be sold for thousands of dollars. Nigeria is Africa’s largest oil producer, churning out about two million barrels a day. But a lack of fully functioning refineries means crude is exported, processed and then imported for use. Much of it is shipped through the narrow marine corridor into Lagos. Hundreds of ships wait for days on the horizon of the Gulf of Guinea to get into the port and discharge their goods. On the way in and out they pass the skeletons of scuttled and abandoned ships, some of which have capsized because of the effects on the tides of the wrecks. Yet there are also suspicions that amidst lax marine regulation, companies treat Lagos’ waters as a ship refuse site, avoiding incurring the expense of disposing of old vessels. Experts say the wrecks act as groynes, halting the flow of sand downshore and accelerating erosion. Lack of regulation on the waters has also helped illicit activity thrive, turning the ghost ships into hideouts for sea criminals. 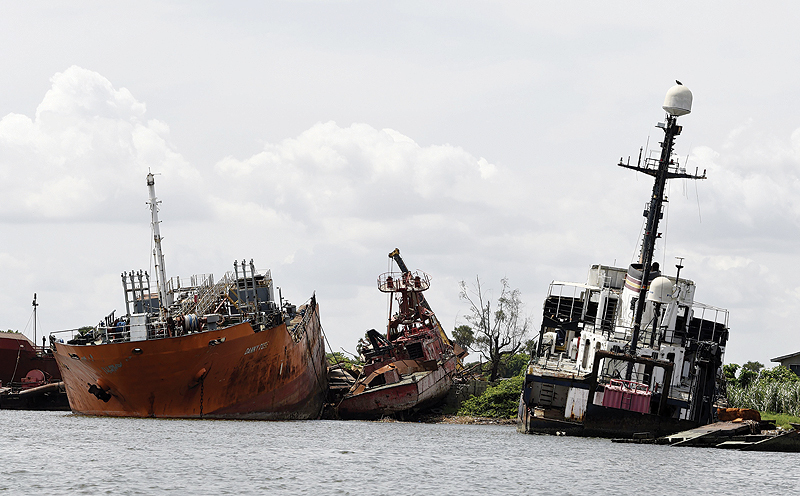 The Nigerian Maritime Administration and Safety Agency, which polices the country’s waterways, says it is proactive in removing the likely hundreds of wrecks but concede that removing them is expensive. Taibat Lawanson, a professor of urban planning at the University of Lagos (UNILAG), said the price of removal was prohibitive. “Because removing them is so costly, neither the state government nor the federal government takes enough responsibility for their removal,” he said. In Lighthouse Beach, a mostly quiet get-away lined by large beach houses, a wreck at the very end of the shore has been a landmark for visitors for years. In parts of the waterways, scuba-diving and spearfishing capitalize on the wrecks aesthetics and the aquatic life it attracts. Yet many of the wrecks, below sea level and invisible above it, present numerous dangers. A 6:00 pm curfew exists for commercial boats, which is imposed in part to prevent accidents.